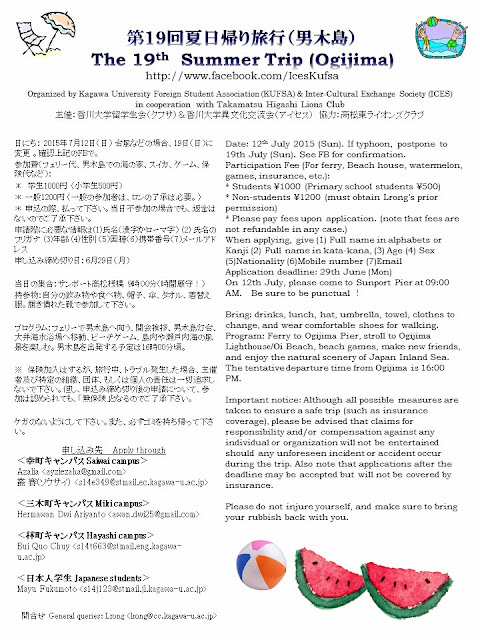 Dear everyone, the deadline for the application is extended to 3rd July (Fri). Reason is, I just found out that there are some students who were not aware of the announcement we made in Facebook. Join us for a fun day! Date: 12th July 2015 (Sun). If typhoon, postpone to 19th July (Sun). See FB for confirmation. Program: Ferry to Ogijima Pier, stroll to Ogijima Lighthouse/Oi Beach, beach games, make new friends, and enjoy the natural scenery of Japan Inland Sea. The tentative departure time from Ogijima is 16:00 PM. Please do not injure yourself, and make sure to bring your rubbish back with you.